This week both of the girls I nanny came down with a cough and runny noses. Needless to say, by the end of the week I too had a runny nose, cough, and a fever. Not fun! I don't like to take medications unless I absolutely have to, so this weekend I have been drinking lots of warm water with honey and lemon and using my Cinnamon Cough Remedy. It doesn't taste the best, but it works. Cinnamon is used to treat a variety of ailments particularly those pertaining to the digestive, respiratory, and circulatory systems. It is an anti-inflammatory, antibacterial, and expectorant, making it ideal for treating coughs. 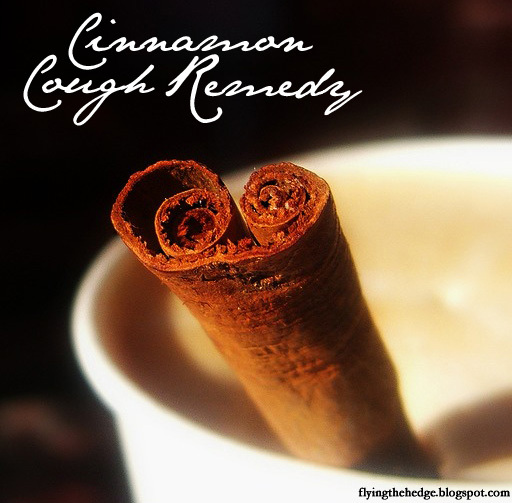 Mix and drink twice a day to soothe cough and cold. I have a hard time drinking it all because I am not a huge fan of cinnamon, let alone a whole tablespoon of it. Flu season will be upon us soon and with little ones back in school, the likelihood we will all be having a cough is high. Keep this in your arsenal of herbal remedies this season to reduce symptoms and fight infection.